The Vietnam Tourism Hanoi JSC debuted its double-decker bus tour on November 30, offering free-of-charge services for passengers until December 2. The buses, named Vietnam Sightseeing, will operate from 9am to 5:30pm daily at 30-minute intervals. Along the 14.8km route starting from Dien Hong Park on Ngo Quyen street, there will be 10 stops at which tourists are able to hop-on or hop-off. Its passing destinations consist of the Vietnam Military History Museum, Thang Long imperial citadel, Quan Thanh Temple, Tran Quoc Pagoda, Ho Chi Minh Mausoleum, the Temple of Literature, Hoa Lo Prison, St. Joseph's Cathedral, the Vietnamese Women’s Museum, and the Hanoi Opera House. This is the second route of its kind opened in the capital, with 40 percent of its destinations differing from that of the first route provided by the Hanoi Transport & Services Corporation. Tickets cost VND219,000 (USD9.39) for 4 hours, VND329,000 (USD14.11) for 24 hours, and VND479,000 (USD20.54) for 48 hours. By comparison, the respective prices of the first service are VND300,000 (USD12.86), VND450,000 (USD19.3), and VND650,000 (USD27.88). 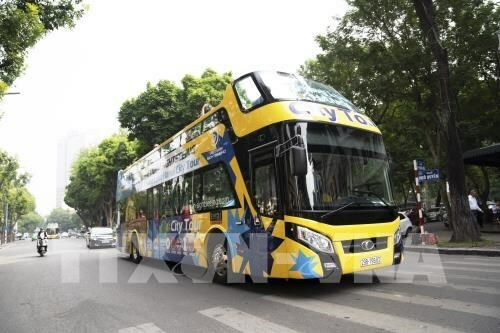 On May 30, the first double-decker city tour opened, with hop-on and hop-off services at 13 stops, running through 25 streets and taking tourists to 30 destinations around the city. The buses run every 30 minutes from 9am to 5pm, and are equipped with an automatic multi-lingual system in Vietnamese, English, Chinese, Japanese, and Korean. According to the municipal Department of Tourism, the capital city welcomed nearly 20 million visitors in the first nine months of 2018, an annual increase of 9.2 percent. Of the total, foreign visitors are estimated at 4.3 million, up 20 percent year-on-year, and accounting for nearly 40 percent of the total number of foreign tourists to Vietnam.